Are you getting ready for St. Patrick’s Day yet? Being part Irish myself, I find there is always a reason to wear a St Paddys t-shirt, all year long. As luck would have it, for this first Friday of the March, we have a free download for you to create your own! Now, we usually offer a free PDF to get your crafting started. 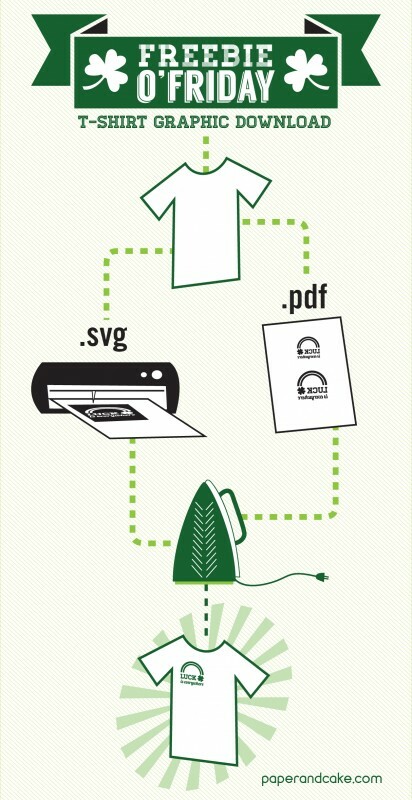 But this month we are adding an .svg file with our St. Paddys t-shirt logo to use with your Cricut or Silhouette machine. Fun, right? For the PDF version, you will need to print it on iron on transfer paper (please read the manufacturers instructions) – and for the .svg you will need transfer material – or you could use some vinyl to decorate an item other than the tshirt. Let us know if you have any questions with the process – and as usual, we would LOVE to see what you create with your Freebie!